The best of the West is highlighted in this exciting road trip! Camp under the stars and hike in beautiful National Parks with new friends on this small group active adventure tour! 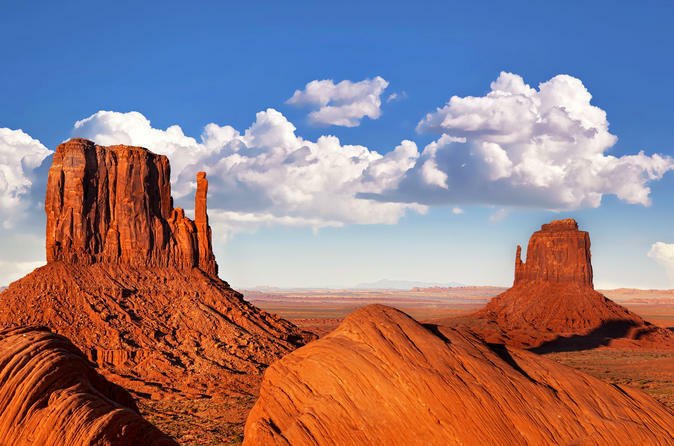 Packed with some of the most important "must see in your lifetime" destinations of the American West in just 11 days, this trip offers great value in how many incredible experiences it offers. From the bright lights of Las Vegas to the most epic and beautiful national parks of the Southwest, this tour will leave you spellbound. Day 1: Meeting in the morning in our Las Vegas hotel with the guide. We travel along high desert scenery, making a stop for lunch Seligman, AZ; the "birthplace of Route 66". Arrive Grand Canyon National Park. We head to the visitors center and walk along the rim of the Grand Canyon. Day 2: A full day in Grand Canyon National Park. Choose between a strenuous all day hike into the canyon, a moderate hike to the first water station, or an easy day of strolling the Rim Trail. We meet up in the evening again for dinner at camp. Day 3: We drive to Lake Powell today to meet our Navajo guide for a private tour of two slot canyons. We spend the morning hiking and photographing Antelope and Rattlesnake Canyon. In the afternoon the day will be for swimming and water sports in Lake Powell. Day 4: An exciting day awaits us as we travel to Monument Valley National Tribal Park. Once arriving we embark on an all day tour by 4x4. We spend the evening in 'hogans'; traditional Navajo homes. Our Navajo hosts will prepare a traditional meal for us, sharing folk stories of their rich culture and traditional dances around the campfire. Day 5: Our destination today is Moab, known as the adventure sports mecca of the USA. Three nights will be spent here to truly experience all Moab has to offer! Upon arrival we will visit Arches National Park a hike to the 'Delicate Arch', the famous icon of Utah. Day 6: Today is a free day in Moab. Your choices include an optional mountain biking tour, canyoneering adventure or a 4x4 tour. Your guide will assist you in reservations. For those who wish to not book an optional adventure, the guide will lead a group hike in the Moab area. Day 7: We travel to Canyonlands National Park for a hike through the rugged landscape. We spend the entire day hiking the Canyonlands with a stop at Dead Horse Point State Park before returning back to Moab for the evening. Day 8: We drive along Utah’s Route 12; known as the most beautiful highway in the U.S. through the Grand Staircase-Escalante Wilderness. Our destination today is Bryce Canyon National Park. We set out on a group hike. Day 9: This morning we drive to Zion National Park where we will spend the day hiking. Choose between the bucket list hike of Angels Landing or take the shuttle to viewpoints to explore the beauty of the Park with shorter hikes. Day 10: We pack up camp and depart for Las Vegas; the Entertainment Capitol of the World!. Free time will be given to walk and explore the Strip area and its many themed casinos. An optional limo tour will be offered to cruise the strip in style, dropping us off downtown at Fremont Street.